Projects In Knowledge developed MedImage Cases: Multiple Sclerosis CME curriculum to provide clinicians with case studies addressing newer neuroimaging methodologies, along with conventional ones, for diagnosing, monitoring, assessing disease worsening, predicting prognosis, and assessing treatment responses to guide therapy. 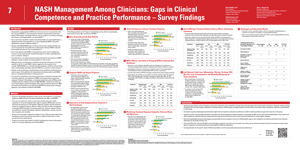 Self-reported data provided by clinicians on intent to make changes in their practice post-activity, as well as a follow-up as to what they have implemented and how it has impacted patient outcomes, was analyzed from a sampling of cases from the series. Co-authors Elaine Rudell, Patty Peterson, James D. Bowen, and Daniel Pelletier presented the findings in a poster at the 2019 ACTRIMS Forum in Dallas. How Are New Technologies Affecting Patient Health? Projects In Knowledge, along with its technology partner @Point of Care, has developed a clinician learning and cognitive decision-making CME platform, paired with a HIPAA-compliant patient companion app, on Rheumatoid Arthritis. The @Point of Care platform uses AI and cognitive learning paired with natural language processing in the form of Ask with Watson search engine tool to answer clinical questions at the point of care, simplifying access to curated, clinical information. @Point of Care is presenting a poster at the 2019 SACME Annual Meeting on how new technologies affect patient health and outcomes. 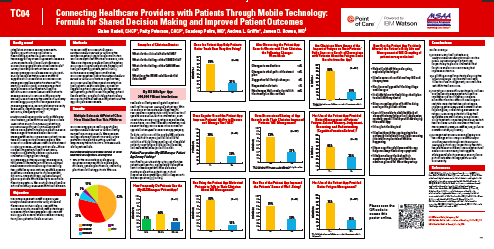 Shared Decision Making Through Mobile Technology: Formula for Improved Patient Outcomes is being presented at the 2018 Annual Meeting of the Consortium of Multiple Sclerosis Centers (CMSC). 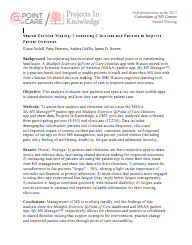 The study surveyed neurologists, psychiatrists, family practitioners, PCPs, and other clinicians, as well as patients across the U.S., to assess how clinicians engage in the @Point of Care platform (which is paired with Watson’s search engine tool), and how patients are regularly using the Multiple Sclerosis Association of America (MSAA)'s patient app, My MS Manager™, to help track and subsequently share disease data with their clinicians. @Point of Care, in partnership with the Multiple Sclerosis Association of America (MSAA), surveyed neurologists, psychiatrists, family practitioners, PCPs and other clinicians, as well as patients across the U.S. to assess how the Multiple Sclerosis @Point of Care platform and the My MS Manager patient app are being used. The findings from this survey were presented as a plenary session (oral) at the 2017 Consortium of Multiple Sclerosis Centers (CMSC) Annual Meeting. Projects In Knowledge developed two CME educational activities on nonalcoholic steatohepatitis (NASH), and using clinicians' self-reported responses, evaluated the effectiveness of the educational interventions. 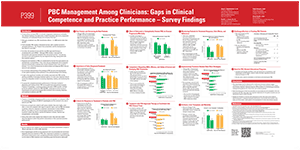 Among the information analyzed was the self-reported intent by clinicians to make changes in their practice post-activity, as well as a follow-up as to what they have implemented and how it has impacted patient outcomes. @Point of Care has partnered with the Multiple Sclerosis Association of America (MSAA) to bring the Multiple Sclerosis @Point of Care platform and the My MS Manager patient app to clinicians and patients across the U.S. @Point of Care surveyed neurologists, psychiatrists, family practitioners, primary care practitioners and other clinicians, as well as patients, to assess how they utilize these apps. Survey co-authors Elaine Rudell, CHCP and Sandeep Pulim, MD, presented the findings in a poster at the 13th Annual Connected Health Symposium. @Point of Care, in partnership with the Multiple Sclerosis Association of America (MSAA), surveyed neurologists, psychiatrists, family practitioners, primary care practitioners and other clinicians, as well as patients across the U.S. to assess how they utilize the Multiple Sclerosis @Point of Care platform and the My MS Manager patient app. Survey co-authors Elaine Rudell, CHCP, Patty Peterson, CHCP, Sandeep Pulim, MD, Andrea L. Griffin, and James D. Bowen, MD presented the findings in a poster at the 2016 Consortium of Multiple Sclerosis Centers (CMSC) Annual Meeting. Projects In Knowledge surveyed over 5500 medical and general oncologists, pulmonologists, radiologists, radiation oncologists, thoracic surgeons, internal medicine specialists, family practitioners, and primary care practitioners to assess how they utilize the Non-Small Cell Lung Cancer @Point of Care dashboard and patient companion app. 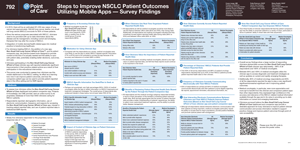 Survey co-authors Elaine Rudell, CHCP, Patty Peterson, CHCP, and Corey Langer, MD, presented the findings in a poster at the 2015 International Association for the Study of Lung Cancer’s (IASLC) 16th World Conference on Lung Cancer. Projects In Knowledge surveyed over 8500 gastroenterologists, hepatologists, internal medicine specialists, family practitioners, and primary care practitioners to assess their competence and practice performance regarding the identification and management of patients with nonalcoholic steatohepatitis (NASH) and the need for continuing education on this topic. Survey co-authors Elaine Rudell, CHCP, Patty Peterson, CHCP, and Arun J. Sanyal, MD, presented the findings in a poster at the 2015 AASLD and Industry Colloquium: Novel Targets and Therapies in Liver Disease in Research Triangle (Durham), North Carolina. Projects In Knowledge’s survey of 6000 gastroenterologists and hepatologists revealed gaps in competence and practice performance regarding the management of patients with primary biliary cirrhosis (PBC) and the need for continuing medical education on this topic. 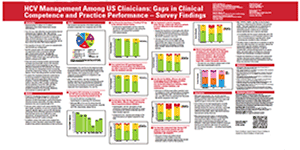 Survey co-authors Henry C. Bodenheimer Jr, MD, David E.J. Jones, MD, PhD, Patty Peterson, CCMEP, and Elaine Rudell, CCMEP, presented the findings in a poster at The International Liver Congress™ 2014, 49th annual meeting of the European Association for the Study of the Liver, in London, UK. 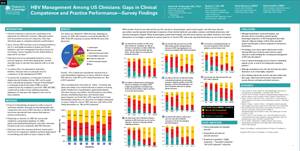 Projects In Knowledge surveyed more than 6500 gastroenterologists, hepatologists, infectious disease specialists, and other clinicians to assess their clinical competence and practice performance in managing patients with chronic hepatitis C virus (HCV) infection and guide the development of future continuing medical education programs. 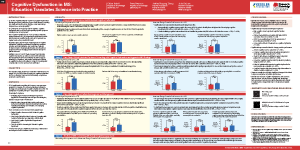 Survey co-authors Ira M. Jacobson, MD, David R. Nelson, MD, Patty Peterson, CCMEP, and Elaine Rudell, CCMEP, presented the results in a poster that was displayed at the 2013 annual liver disease meeting held in Washington, DC. Projects In Knowledge and the Kessler Foundation Research Center collaborated to assess improvements in knowledge, competence, and practice performance in clinicians who completed CME courses focused on cognitive dysfunction in multiple sclerosis. Co-authors Elaine Rudell, CCMEP, Patty Peterson, CCMEP, Jeffrey Yangang Zhang, PhD, and John DeLuca, PhD, presented their findings in a poster that was displayed at the 2012 Consortium of Multiple Sclerosis Centers (CMSC) annual meeting in San Diego, CA, as well as in a published CMSC abstract. 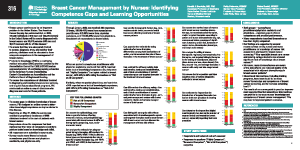 Elaine Rudell, CCMEP, and Patty Peterson, CCMEP, from Projects In Knowledge, and Harold J. Burstein, MD, PhD, collaborated on a poster that reported proprietary survey findings that identified knowledge gaps and learning opportunities for clinicians who treat patients with breast cancer. The poster was displayed at the 2009 American Society of Clinical Oncology (ASCO) Breast Cancer Symposium, General Poster Session B, held in San Francisco, CA. Projects In Knowledge designed and conducted an online survey to determine if clinicians were knowledgeable and competent in the area of hepatitis B virus infection or if they needed new educational interventions that would improve practice performance. A total of 591 clinicians from all over the country participated. Co-authors Elaine Rudell, CCMEP, and Patty Peterson, CCMEP, from Projects In Knowledge, along with Adrian M. Di Bisceglie, MD, FACP, and Robert G. Gish, MD, presented the results in a poster that was displayed at the 2009 Digestive Disease Week (DDW) meeting.